Shades of grey with white joinery are complimented by stained timber. 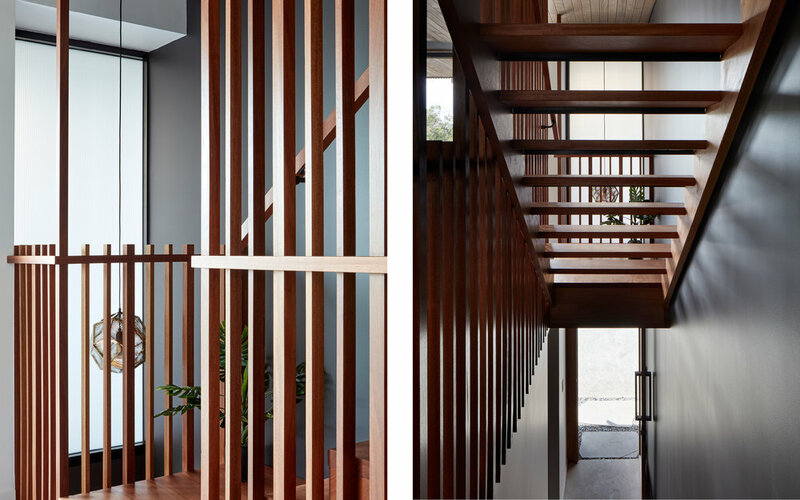 A beautiful timber staircase with a skylight creates different patterns of light of shade throughout the day. Located in an inner city Brisbane suburb, this project is a typical infill-development taking advantage of a prime location. Behind a Queensland vernacular house the contemporary duplex is placed on a steeply sloping site. With the garages half dug in, the design achieves a level north facing back yard adjoining to the living areas. Being in a neighbourhood dominated by single or double-storey character houses, the duplex complements the suburb in scale, bulk and choice of materials. The master bedrooms in the upper level are enjoying city views, which have been framed with large doors and balconies. A calming colour scheme combined with a simple palette of materials achieves a contemporary yet timeless appearance.